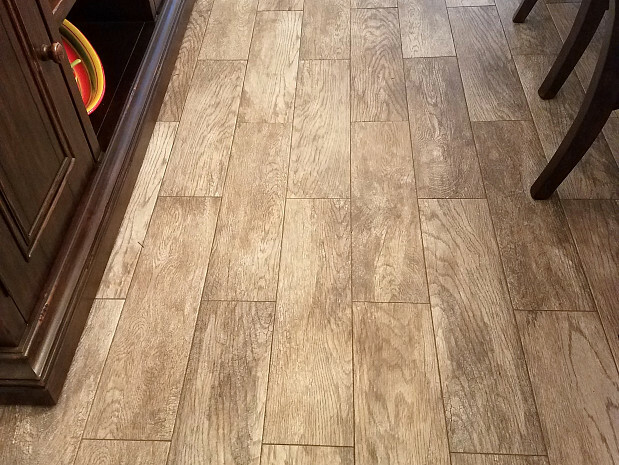 WHAT OUR NETWORX CONTRACTOR DID FOR US: Tiled 500 square feet of floor. WHY I CHOSE HIM: Knowledge of his trade, photos of completed jobs. We have a busy house full of kids and dogs. That’s why we decided to go with tile floors to replace the original builder beige carpet. We started out by tiling our living room with another company a year ago. When “our” tile went on sale at Home Depot, we rushed to buy more, because we were nervous that it was going to sell out and we wouldn’t be able to match it in the future. We wanted to tile the other half of our lower level, 500 square feet including a family room and a dining room. I feel like I have to defend tile to a lot of people. They’ll stare at you when you say you’re tiling your living room floor, but I prefer tile. We don’t care for hardwood or carpets and with kids and dogs, we appreciate not only the look of tile but also how easy it is to clean and maintain. 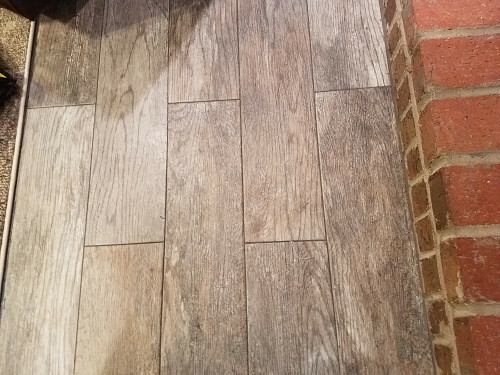 Our floors are done with long porcelain planks of faux distressed wood, which don’t scream “Tile!” like a bathroom. We love it. Although I got more than one bid on the flooring project, I really liked George Stewart of C & M Tile & Marble LLC. He ended up being the same price as the other contractor, but when he first came out to offer a bid, I basically already decided that even if he cost more, I wanted him. Since my dad has been a home remodeler my whole life, I’m used to talking about flooring and so on. When I spoke with George and looked at the photos on his website, I could tell he knows what he’s doing. He only works with tile and marble and he’s very good at it, and he uses Schluter Ditra (a special waterproofing underlayer for ceramic and stone tile floors). My husband and I ripped up the old carpet and did our subfloor ourselves once we had scheduled with George. We wanted the floors done Thanksgiving so he squeezed our job in on a weekend to accommodate us. He came 3 days. The first day was approximately 4 hours of prep work; the second day was about 6 hours of tiling, and the last day he came to grout for 4 hours. Altogether he was in my home about 15 hours. George showed up for the estimate when he said he would. All his crew members showed up as scheduled, too. They were pleasant to have in my home. They were fine with my small kids and dogs. George explained everything he was doing. They cleaned up at the end of every day. The job was done so quickly we couldn’t believe it … and done very well. I can’t say it enough: George Stewart and his guys did a great job and I have already referred them to my neighbor 2 doors down. I don’t think I have good advice for homeowners looking to hire a contractor. It’s so hard; we called several people who never showed up. That almost counts as getting an estimate and definitely tells you something about their work ethic, because if they won’t even come to see the job, they’re probably not going to come to do the job. I like the Networx website. It was helpful because the companies contacted me, which means they had an interest in coming out and it also narrowed the field down to tile contractors in my area. However, I still think word of mouth is the best, since you can go to see the work. 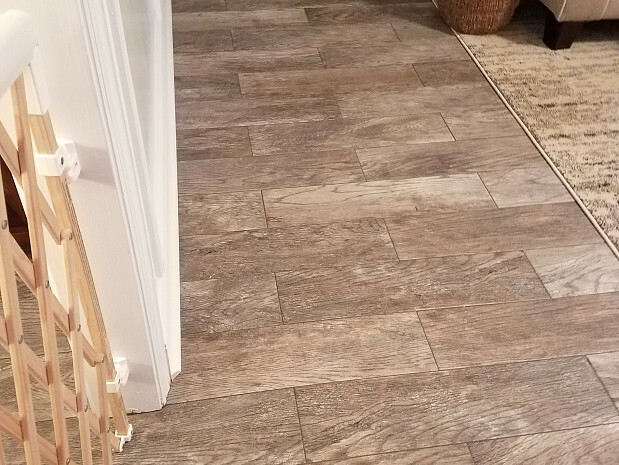 You can look up flooring pros on the internet but you don’t know what their work actually looks like or whether they’ll even finish the threshold before they disappear. It's Easy, Fast and Free! Bathroom Flooring Replacement and a Mystery Solved by Jennifer G.
A Quality Interior Painting Project by Stan J. Why I Chose Tile Floors After A Horrible Water Damage Experience by Dennis O.